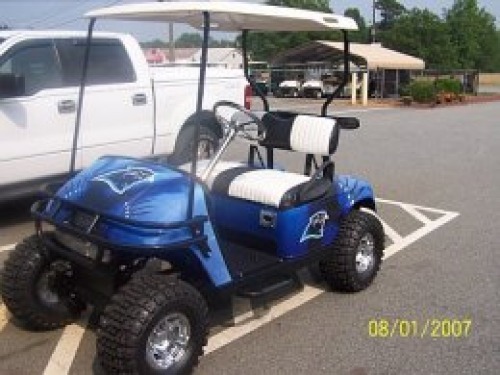 *SOLD* *Custom Carolina Panther Body**SOLD* 2005 E-Z-GO PDS Electric Golf Car *Custom Carolina Panther Body* Black front brush guard, Black/white two tone seat, stainless steel steering wheel column cover, Carbonfiber steering wheel, black diamond plate rocker panels, black nerf bar, factory light kit (headlight, tail lights), billet pedal kit, billet recepticle cover, carbon fiber dash with 2 locking doors, lift kit, custom tire/wheels. Must see!! One of a kind! !